The historic San Agustin Church in Intramuros, Manila will be the venue for one the most special Christmas presentations of the year. This is "Villancicos ng Paskong Pilipino," a concert featuring Spanish and Filipino "villancicos", December 6 at 7:30 p.m. The "villancico" is an old music form from Spain and Portugal that has come to be associated with Christmas. "Villancicos ng Paskong Pilipino" hopes to create awareness about the Filipino villancico heritage and to bring back memories of Christmas celebrations in the Spanish era. 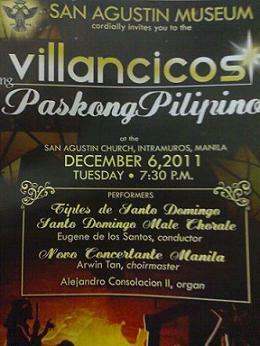 Performing the villancicos will be the Tiples de Santo Domingo and the Santo Domingo Male Chorale known as the oldest boys' choir in the Philippines conducted by Eugene de los Santos and the Novo Concertante Manila with Arwin Tan as conductor.